Synopsis: Dr. Tim Mason (Roger Pryor) is conducting ground-breaking research in cryogenics. In a public demonstration, he lowers the body temperature of a patient until she is in a coma-like state. Five days later he brings her out of it, and after the procedure her chronic pain has diminished considerably. After the demonstration, Dr. Mason tells his fiancee, nurse Judith Blair (Jo Ann Sayers) that his results are encouraging, but not what he had hoped. He reveals that most of his experiments are derived from the work of a mysterious Dr. Leon Kravaal (Boris Karloff), whose book on the subject of cryogenics hinted that he was in possession of a mysterious process that allowed the body to be completely frozen. Laboratory animals exposed to this process would completely recover from the freezing. Moreover, cancer cells in test animals disappeared after prolonged treatment, because the body's immune system was still working while the cancer cells were suspended. Mason is fascinated by these revelations, and would love to get more of the details of the procedures from Kravaal; but the scientist vanished ten years earlier. The hospital administration disapproves of all the meddlesome publicity Mason is generating and they force him to take a leave of absence. Seeing an opportunity to track Kravaal down, Mason and Blair drive up north to Kravaal's last known address. This turns out to be a spooky old house on a small island. The place had been abandoned since the disappearance of Kravaal, the county sheriff, county prosecutor, town doctor and two other townspeople. Exploring the house, Dr. Mason and Judith discover a passage from the basement that leads to an abandoned laboratory, and beyond that, an icy underground cavern. In this cavern Dr. Kravaal is discovered. Using the techniques he's developed to revive hypothermic patients (i.e., warming them slowly and pouring hot coffee down their throats) Kravaal eventually comes around. He's astonished to find that he has been in suspended animation for ten years. Then he reveals that in a second chamber, behind the first, there are four bodies. In a flashback sequence, Kravaal explains that the elderly Jasper Adams had come to him in hopes that frozen therapy might cure his cancer. Adams' nephew became suspicious, and the county prosecutor brought Kravaal in. In the prosecutor's office the town doctor avers that he had previously examined Adams, and it was clear the man's cancer was terminal. Kravaal scoffs at the doctor's hidebound pronouncements, but under duress he agrees to take the men to see Jasper Adams during his treatment. Kravaal takes them, along with the county sheriff, to the island and the underground cavern. Seeing Adams' frozen body, the doctor declares him dead, and the sheriff places him under arrest. Kravaal uses a beaker of chemicals to render his captors unconscious, but in the process places everyone -- including himself -- in a state of suspended animation. After relating this amazing story, Mason and Judith help Kravaal revive the others, all of whom are astonished that ten years have passed and that they have all probably been declared dead. Comments: I'm a little worried about the state of modern medicine, at least as it's depicted in The Man With Nine Lives. Dr. Mason, in his opening demonstration of "frozen therapy", monitors his patient's core temperature by slipping a mercury thermometer under her tongue. He lowers her temperature by piling more ice cubes on top of her, and raises it by applying blankets and hot coffee. This is ground-breaking medicine? Her body temperature could be controlled more precisely by putting her in a big styrofoam cooler. And I'm a bit worried, too, about the competence of law enforcement in Dr. Kravaal's home town. The guy disappears at the same time as the county sheriff, the town's doctor, Jasper Adams and Adams' nephew. Presumably, Kravaal's house was searched by the police. But they find nothing, while two knuckleheads from the city stumble onto the underground chambers that contain the perfectly preserved bodies of the missing people. Alas, this is only the beginning of the problems with The Man With Nine Lives, which bears a suspicious resemblance to Before I Hang and particularly The Man They Could Not Hang: good scientist develops scientific breakthrough that will benefit all humanity; society misinterprets his genius as madness; good scientist goes bad. All these films are from Columbia studios, all feature Boris Karloff, and all were made between 1939 and 1940. Was there a sudden demand for such films? Did some crazed producer decide that the studio should continue grinding away until the definitive mad scientist movie was in the can? 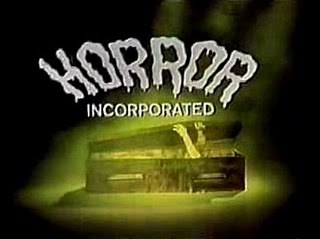 Somehow I imagine an obsessive Boris Karloff-esque character working late at the studio, demanding that his screenwriter guinea pigs deliver him the ultimate mad-scientist-gets-revenge-on-an-unbelieving-world narrative, pronto! 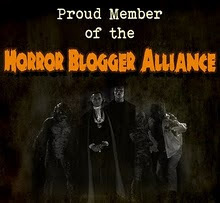 Truth is, we've already seen this movie, and -- sorry, Boris Karloff, you were just fine in this one, again -- maybe it's time to move on to something new. But before we do so, I want to talk about the bits of exposition we see in these old movies. Added to the many miracles performed by modern science that have accounted for the saving of thousands and thousands of human beings, comes its newest and most modern discovery -- frozen therapy. Estimates of how long frozen therapy can produce a state of suspended animation range from days to years. But on the fact that diseases can be arrested -- that life can be prolonged, by freezing human beings in ice, the medical world agrees. In research hospitals today, men and women are alive and breathing -- their bodies encased in ice. Immediately following this lugubrious set-up, we have another expository device, and one that's nearly as old -- a series of newspaper headlines spinning up to the camera. I complained about the generous use of this technique previously, but here we are again, 42-point type blazing away. CURE FOR CANCER CLAIMED! shouts the Daily Express. Amazing breakthrough or slow news day? You be the judge, gentle reader. Roger Pryor is the sort of B-picture lead we must accept for this kind of film, and Jo Ann Sayers does well enough as his tall and bony love interest. Really, this is a Boris Karloff picture, and as usual I admire the way Karloff can convey basic decency with an undercurrent of calculating ruthlessness. Overall, this isn't a bad picture, but it might have been better if we hadn't already seen it couple of times before. 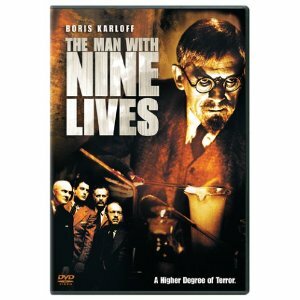 THE MAN WITH NINE LIVES is available on DVD from Amazon. SON OF SHOCK Columbia entry, second in Karloff's 5 picture deal. Roger Pryor, the insufferable D.A. in THE MAN THEY COULD NOT HANG, simply fails to convince as a humanitarian doctor, while Karloff doesn't make his entrance until 20 minutes in. Things do get better as it goes along, but the studio's profit margin for each film was exactly the same, regardless of whether the scripts were good or bad, so they chose to rework the same themes every time. 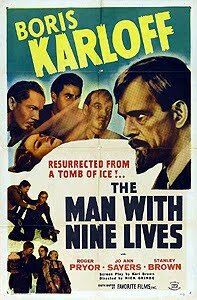 THE MAN WITH NINE LIVES aired twice on CHILLER THEATER, the last in 1969.